Who is Robert Downey, Jr.? "I'm such a work in progress at the moment, it's crazy," he told Rolling Stone last summer, "and life wants me on edge . . . "
On "edge" would seem to be where the actor has spent most of his 43 years. He's had more ups and downs that a yo-yo, all carefully documented by the tabloid press. His personal problems have often overshadowed his career achievements, but then those problems wouldn't have attracted much attention if the man's gargantuan talent hadn't already put him on the public's radar. In The New Biographical Dictionary of Film, David Thomson describes Downey as "one of the most fascinating, mercurial actors around - if one cherishes the notion of the actor as jazz musician: sudden, lyrical, absurd, tragic, comic, and ready to destroy himself for truth." It's hard to argue with Thomson's assessment of Downey. He is certainly fascinating and mercurial, the kind of actor who can take an ordinary line of seemingly innocuous dialogue and imbue it with any emotion he wants and make it sound extraordinarily clever, witty, or profound. Hopefully, Thomson's belief that Downey is "ready to destroy himself for truth" is out of date. He is, after all, an Iron Man now, armed with renewed purpose and a success that was scarcely imaginable a decade ago. With the blockbuster success of the movie inspired by the Marvel Comics superhero, Downey has been on enough magazine covers in the past year to make even George Clooney and Angelina Jolie envious, but he admits he is somewhat baffled by his current success. "Why am I having this year?" he asked in yet another magazine cover story, this one being Entertainment Weekly's year-end issue in which he was named Entertainer of the Year. "To tell you the truth, I haven't fully digested what's happened to me before, during, and after Iron Man. But I do know that I don't want to waste any more time." He was born April 4, 1965 in New York City where his father directed films, the most notable of which was 1969's darkly satiric Putney Swope. Downey Jr. appeared in several of his father's films, but Pound and Greaser's Palace were very much "underground" films, not the kind that attract much notice in the mainstream. Following his parents' divorce, he moved with his father to Los Angeles where he continued acting, but this time off-screen. Since his high school classmates assumed that being a New Yorker was synonymous with being a tough guy, he decided to play the part for their pleasure, carrying a knife in his sock as he rode his bicycle through Santa Monica. "I didn't have an identity," he says now in explaining his behavior. One of his first roles in a mainstream film was also one of the few times his father was given the opportunity to direct for a major studio. 1980's Up the Academy attempted to do for Mad magazine what Animal House did for National Lampoon, but it came and went with little fanfare. Believing that his acting aspirations would be better served on the East Coast, Downey returned to New York where, at age 20, he joined the cast of NBC's long running Saturday Night Live. It's doubtful few fans of the late night comedy show even remember that he was on the show, and he was dropped from the cast after one season. Returning to films, he started to attract notice with roles in Weird Science and the Rodney Dangerfield comedy Back to School before being cast as a hustler in The Pickup Artist, a Warren Beatty produced vehicle for then hot teen queen Molly Ringwald. It was 1987's Less Than Zero, though, that would prove to be his breakthrough. In retrospect, it also proved prophetic, a fictional mirror image of the drug-infused downfall that the actor would soon experience for real. Downey himself compared his role as Justin to "the ghost of Christmas Future." Based on the novel by Bret Easton Ellis, the film followed the lives of three rich Beverly Hills teenagers who have just graduated from the same high school, one of whom, Julian (Downey), begins a long descent into drug abuse. "Only Downey elicits the kind of sympathy to distinguish this drama from a photojournalist essay of the kind that might run in Vanity Fair," Variety said, otherwise panning the film as "even more specious and shallow than the Bret Easton Ellis book it is based on." Roger Ebert, however, awarded the film four stars and hailed Downey's acting as "so real, so subtle and so observant that it's scary." Indeed, it was real for reasons other than the actor's considerable talent. He would later acknowledge that he had been addicted to drugs since he was eight years old. For the time being, though, his performance in Less Than Zero was only a performance, a great one that led to other roles, one of which, 1990's Air America, found him starring opposite Mel Gibson who would prove to be a lifelong friend. The title role in 1992's Chaplin would earn him an Academy Award nomination, but the film would prove to be a major disappointment. Directed by Richard Attenborough, Downey was cast as the legendary silent screen icon, Charles Chaplin, and his performance would earn raves from critics who disliked the film. With help from a coach, Downey adapted Chaplin's posture, and also learned to play tennis and the violin, but his efforts were sabotaged by a hokey screenplay that resembled the worst of Hollywood biopics. "Old-fashioned, overblown and unduly reverential," Rita Kempley of The Washington Post complained, calling it a "monumental epic that cheapens the hero's success by glossing over the failures that surely also shaped the man." Downey, however, "brings a hard-won grace to his performance, but not the panache of a matinee idol nor the wistfulness of a gifted clown." Roger Ebert was panned the film but praised the star who "succeeds almost uncannily in playing Chaplin; the physical resemblance is convincing, but better is the way Downey captures Chaplin's spirit, even in costume as the Tramp." More roles followed, including a part in Robert Altman's all-star 1994 homage to the stories of author Raymond Carver, Short Cuts, and, more impressively, a newscaster in Oliver Stone's bizarre, violent Natural Born Killers. Playing a media huckster in the mold of Robin Leach, Steve Dunleavy, and others who rose to prominence through "tabloid TV," Downey was brilliant. There were more films, 14 in all between 1995 and 1999, including U.S. Marshals, a pointless sequel to The Fugitive. "I don't remember anything about U.S. Marshals," he later said, "except that we were running around and pretending like we could ever hold a candle to (the original film)." Around this time, it was becoming hard for any of Downey's film roles to hold a candle to the drama in his personal life. In the past, Downey used his drug arrests as fodder for laughs during talk show appearances because, he says, "jailhouse stories really bring the house down." But he now wishes the traumatic events could be forgotten. "There seems to be a bit of erasure happening," he says. As for why Downey turned to drugs in the first place, director Michael Hoffman suspects it's related to the same qualities that make him such a brilliant actor. Downey, he says, is "so intuitive . . . it was easier to live in a slightly medicated state." In 1999, Downey moved from a medicated to state to a state penitentiary where he was confined for a year following another in a long line of arrests. After his release, he made a brief comeback by joining the cast of the Fox sitcom Ally McBeal, winning a Golden Globe for Best Supporting Actor. Despite this success, Downey says "it was my lowest point in terms of addictions." There were more arrests, some time spent on probation, a stint in a rehabilitation facility, and also a pink slip from the TV show, all of which stopped his career dead in the tracks for a time. Downey was Woody Allen's choice to star opposite Winona Ryder in his 2000 film, Melinda and Melinda, but "We couldn't get bonded." Before this cold spell, he did manage to squeeze in a superb performance as Michael Douglas' book editor in the same year's Wonder Boys. It was his Air America co-star, Mel Gibson, who came to his rescue by offering him the title role in the 2004 film, The Singing Detective, and by dipping into his own pocket to pay the insurance himself. More film work followed, including roles in Gothika, Good Night and Good Luck, and Kiss Kiss Bang Bang, the latter of which seemed to signal the start of a major comeback if the early screenings were any indication. "The Cannes film festival was shocking," co-star Val Kilmer said. "The ovation was so long. At one point I honestly thought they were applauding Robert for being alive." Downey was alive, but Kiss Kiss Bang Bang did not resuscitate his career. "It was going to be my coming-out party," Downey said of the film. "When it tanked, I was heartbroken." But his heart and career would soon be on the mend thanks to an unexpected smash. The blockbuster success of Iron Man took everyone by surprise. The character lacks the name recognition among the general public that Spider-Man, Batman, or The Hulk enjoys, and Downey's name was anything but a guarantee of mammoth ticket sales. In retrospect, it seems likely that it was Downey's presence in the film that really brought out the crowds. His name may not have meant a lot at the box-office a month before the film's release, but knowing that "one of the most fascinating, mercurial actors around," in David Thomson's words, was headlining a comic book movie undoubtedly made people sit up and take notice, then head to the multiplex to see how Iron Man differed from all the rest. "He doesn't behave like most superheroes," Roger Ebert wrote, describing Iron Man/Tony Stark as "created from the persona Downey has fashioned through many movies: irreverent, quirky, self-deprecating, wise-cracking." Actor Jamie Foxx, who co-stars with Downey in the upcoming The Soloist, believes people saw Iron Man "because Robert Downey Jr. was in it. That's why I went." Marvel, the comic book turned movie studio behind the film, was adamant that Downey would not play the part no matter how often or passionately directed Jon Favreau recommended him. Downey craved the role, and refused to back off in pursuit of it even as Marvel told Favreau that "under no circumstances are we prepared to hire him for any price." Downey was eventually granted a screen test. At that point, Favreau said, "all argument ended." The part was his. Tony Stark, alias Iron Man, is far from a conventional superhero. For one, he has no superpowers. He is, as Matt Fraction, the writer of the Marvel comic, says, "an alcoholic, an inventor, and an adrenaline addict." 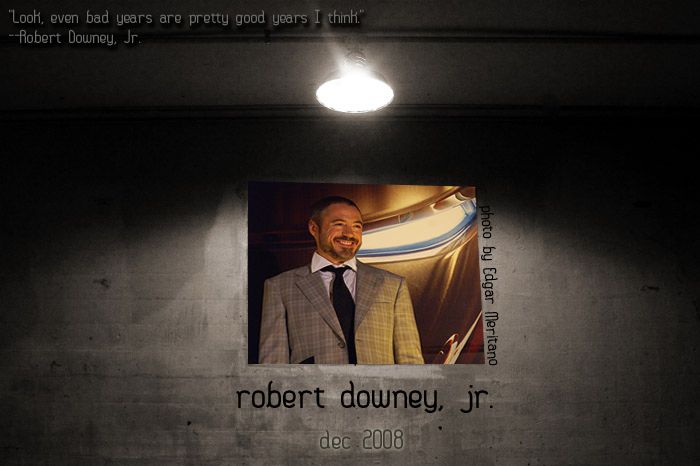 The casting of Downey, he says, "is absolutely perfect ." In addition to being a great actor, "Downey and Stark share the disease of addiction. You can play being an addict, or you can actually be one and understand the obsession and monomania of the illness." That Downey was the perfect actor for the role was apparent when the film was released and earned critical acclaim in proportion to its popular success. Stephanie Zackareck of Salon.com said that "although Downey spends a certain amount of screentime inside that suit, his face still carries the movie, giving it emotional weight . . . He's airborne, even without the suit." Roger Ebert found Downey's performance "intriguing, and unexpected," and thought that "the screenplay seems almost to have been dictated by Downey's persona . . . He's flippant in the face of disaster, casual on the brink of ruin." A series of Iron Man sequels are in the works, but Downey has already played Tony Stark a second time. He appears in a brief cameo at the end of The Incredible Hulk with whom Iron Man is slated to share the screen when The Avengers reaches theaters a few years from now. With the success of Iron Man, Downey is arguably the hottest actor in Hollywood. "Right now," Downey told Rolling Stone last summer, "my Blackberry is literally overloading and crashing, and the phone is never not ringing. It's crazy." Crazy is an apt description of Tropic Thunder, the loony Ben Stiller directed film within a film that became Downey's second consecutive hit in summer 2008. Alongside Stiller and Jack Black, Downey emerged the star of that one, too, as Kirk Lazarus, a pompous Australian Method actor who wears blackface to star as an African American in a Hollywood epic about Vietnam. "The award for best in show has to go to Robert Downey Jr.," Peter Travers wrote in Rolling Stone, adding that he's "so off-the-charts hilarious that you want to stand up and cheer." Having survived so much time in the abyss, Downey has a lot of people cheering him on as his career reaches new heights. "People in this town are really rooting for this guy," Jamie Foxx said. "Not just because they like him, but because he's great as an actor." Robert Downey Jr. has always been great as an actor, but his various troubles have often prevented him from flexing his artistic muscles as much as his fans would like. "I'm a soldier who didn't know how nasty the battle was going to be," he said recently, "and now I've got a Purple Heart, and I'm back." As the reception his recent films have received prove, his return is being welcomed with open arms.